JERUSALEM (Ma’an) — Israeli authorities closed the main entrances to East Jerusalem neighborhoods with cement blocks on Wednesday, preventing Palestinians from preparing for the Eid al-Adha holiday, locals said. Locals told Ma’an that Israeli authorities closed the three main entrances of the Sur Bahir neighborhood, as well as three main entrances leading into the neighborhood of Jabal al-Mukabbir. 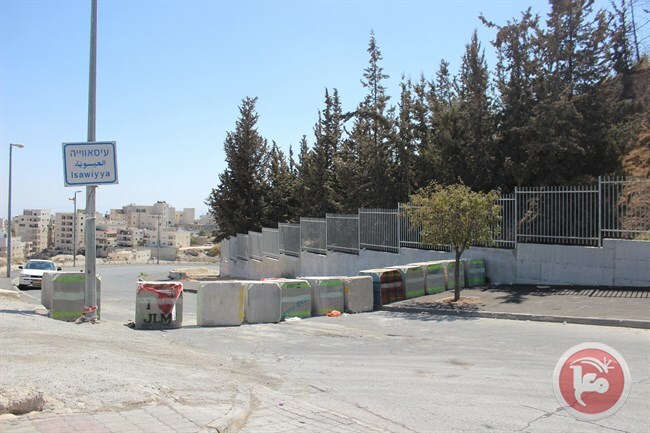 The main entrance to al-Issawiya and the two main entrances of Silwan were also obstructed by iron barricades and cement blocks, while Israeli forces and patrols were deployed at the entrances. Locals said the road closures were preventing their communities from moving freely, with many residents reporting they are unable to leave their neighborhoods in order to buy the necessary items to prepare for the Muslim holiday of Eid al-Adha, which begins Wednesday evening. The closures come as Israeli authorities continued to impose restrictions on Palestinians attempting to enter the Al-Aqsa Mosque compound, preventing entrance to women who had been blacklisted as well as men under age of 40. The gates leading into the holy compound were also closed, except for the Hatta, Chain and Council Gates. Sources said that 37 right-wing Israelis raided and toured the holy site Wednesday morning under the protection of armed Israeli police, adding that dozens of Palestinians were able to enter and pray in Aqsa by noon. Israeli authorities began ramping up security procedures around the city on Monday in anticipation for the Jewish holiday of Yom Kippur on Wednesday, and the Muslim Holiday of Eid al-Adha which begins in the evening. Tensions skyrocketed in the occupied Old City last weekend, leaving dozens of Palestinian civilians injured by Israeli forces and three Israeli police injured. On Tuesday the Palestinian Prisoners’ Society reported that 150 Palestinians had been detained by Israeli forces in occupied East Jerusalem between Sept 13-22, the majority aged between 13-20. The tensions initially increased as senior Palestinian officials expressed concerns in recent weeks that Israel is restricting access to the compound, a potent symbol of the so-far unrealized Palestinian state. Israeli restrictions on Palestinian movement in occupied East Jerusalem and the West Bank typically increase surrounding religious holidays.